Black Friday is coming up soon. Any insider info or sneak previews? Target's black friday ad shows the new dots will be half off. usually it will be the same with any store selling them. Just saw this. 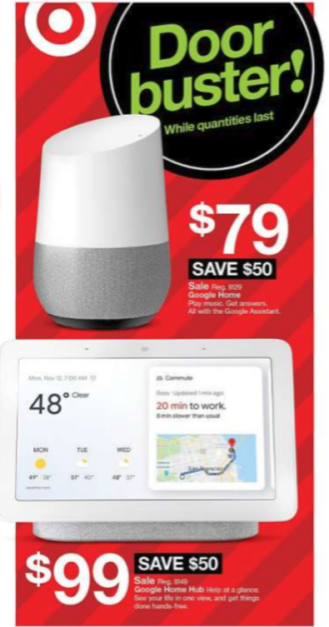 Google Home for $79 and Google Home Hub for $99 at Target. Walmart will have black friday sale before anyone else according to news story. Just noticed that Best Buy has some pre-Black Friday deals. I believe these deals end Sunday night central time. The Insignia Speaker and Alarm Clock with Google Assistant is $24.99 (was $99.99). From several reviews, people have said the speaker sounds better than the Google Home and the Google Mini.